If I seem to be a tad obsessed with pumpkins lately there is a reason, I promise. Apart from tasting great and being very healthy for you too, I had two large pumpkins I bought a month or so ago that I had to use up before we left Umbria so last week I roasted both, and had a “pumpkin day” in my kitchen. I made pumpkin smoothies, pumpkin muffins, pumpkin French toast, pumpkin bread, pumpkin polenta, pumpkin mac and cheese and pumpkin risotto. 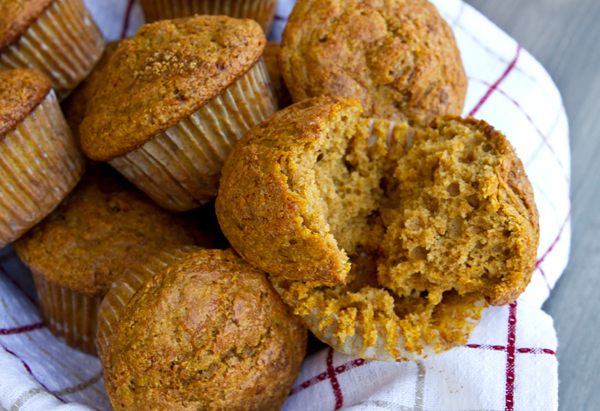 These pumpkin muffins were made that day with my big batch of pumpkin puree and they turned out great. 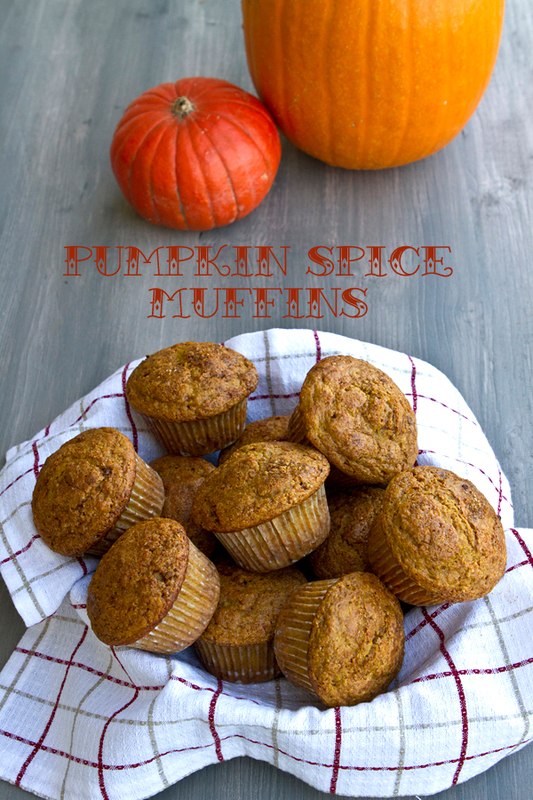 They are moist and tasty, with just enough pumpkin spice flavor. 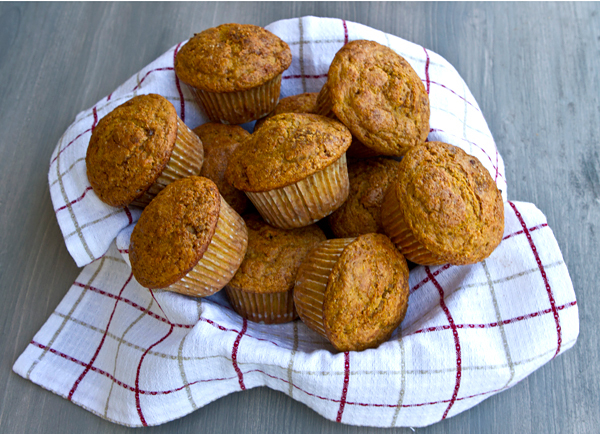 These muffins would be perfect for a quick breakfast on the run, a mid day treat, or packed into the kid’s school lunch. I have become a big fan of oat flour recently, both for the texture it adds to baked goods as well as the flavor and added nutritional value. If you find it difficult to locate oat flour near you, simply make your own. Place regular oats in your food processor or blender, and pulse until you have a powdery texture. Oat flour is packed with nutrients including protein, fiber, B vitamins, antioxidants, and trace minerals (iron, zinc, copper, and magnesium). Using fat free yogurt in place of regular retains moistness but reduces fat calories significantly. Preheat oven to 375 degrees F. and line a 12 cup plus a 6 cup muffin pan with paper liners. Mix together the flours, baking powder and soda, sugars, salt, and spice in a large bowl, then make a well in the center. In another bowl, mix together the pumpkin, yogurt, milk, oil, extract, egg and egg white, then pour this mixture into the bowl with the dry ingredients. Stir just until mixed, then spoon the batter into the prepared muffin pans. Sprinkle the top of the muffins with the brown sugar, then bake for about 25 minutes, or until set.